This has something to do with a test during configure, not your virtualisation settings. I seem to remember it is related to gnome development libs (or something that is installed alongside those). But I don't know which is the magic combination. Actually, I get the same error while building current cebix/macemu code. The VM error occurs if configure can't find vm_alloc.cpp. Similarly, "Windows exceptions" error occurs if sigsegv.cpp is not found. Confirm two files are exist at the directory written in configure file. Using rakslice's code, I tried copying those two files from src/Windows to src/Unix (to match the paths in the configure file), and I also tried editing the configure file to use the ../Windows instead of ../Unix, but I got the same error message. Clearly I don't know enough to get this right. I hope someone expert can modify the macemu code so that it builds in msys. One other issue: "make links" produces a number of error messages with rakslice's code and all other code that I tried. Did you check out rakslice:windows_build_script branch? I could build not rakslice:master but rakslice:windows_build_script. This really isn't worth anyone's trouble (and kanjitalk755 shouldn't waste his time on my failures), but here's what happened when I tried to follow kanjitalk755's build instructions for rakslice's code in msys. ## delete from makefile, line 40, the string "-lpthread"
Again, someone more competent than I am can probably accomplish this, but maybe this will be helpful for future work. You have to add compiler option "-std=gnu++11" in case using old MinGW, latest one doesn't need. Or, try to build using latest MinGW. Thank you for this very impressive information! I will install latest MinGW and try again. OK, following kanjitalk755's expert and generous advice, I've built rakslice's macemu-windows_build_script fork in Msys under Windows 7. I downloaded and installed a fresh copy of MinGW, added the mingw-developer-toolkit from the MinGW Installation Manager, and then (following the excellent guide on this site), created a directory named "src" in my MinGW\msys\1.0\home\MYUSERNAME\ folder. As the guide says, I did this: downloaded the source code from: http://www.libsdl.org/release/SDL-1.2.15.zip and extracted the folder inside the Zip to the src directory. Then I downloaded a ZIP of rakslice's code from https://github.com/rakslice/macemu/tree ... ild_script and extracted the folder inside the Zip to the src directory. and I had a working build, exactly as kanjitalk755 said. Now, is it possible to do something similar with more up-to-date branches of the macemu code? Again, thanks to kanjitalk755 for all his help. With your last version of SheepShaver CD open but there is a problem of color. Indeed 256 do not correspond any more. While on the previous version no problem with colors but no CD. Has you he a solution there? Hi. This is my first post here, sorry for the bother. I've searched high and low and can't find a solution to this. I managed to install OS9 on a Windows build of SheepShaver by using the information on this site. However, I can't get the thing to detect my DVD drive, even using the updated build from March 2015. If I set the drive letter on the GUI frontend, Sheepshaver crashes. If I delete the drive letter, it boots fine. The program doesn't write any error messages to stderr.txt so I'm at a loss at what is going on. Note that ISOs work fine. But the CD does not. I'm running Windows 7 Professional 64-Bit. Hope you can help me figure out what's going on here. Thanks. Hey Cat_7 i actually was using SheepShaver today and i had installed Mac OS 8 on SheepShaver i recently updated SheepShaver from Mac OS 8.0 to Mac OS 9.0.4 and when i try to open the Scrapbook the instructions appear and when i click next SheepShaver crashes. Is this because of the update? Or is it because Mac OS 8.0 was in Spanish and 9.0.4 is in English? Do you have "Ignore Illegal Instructions" enabled? If not, enable it and many issues will go away. You may also have issues with the ROM you are using with it. I enabled "Ignore Illegal Memory Access" but that did not actually change anything. Scrapbook keeps crashing SheepShaver also i can't use internet explorer i try and write "www.google.com"
it appears to load and then SheepShaver crashes. Maybe SheepShaver isn't that compatible with Mac OS 9.0.4 because i saw a video of Mac OS 9.0.4 installed on an iMac G3 and internet explorer was just working fine in the iMac. I think i will just use Mac OS 8.0 but thanks for trying to help me adespoton. And im using an New World Rom. iKnow, I would like to recommend MacOS 8.6 over 8.X for SheepShaver. 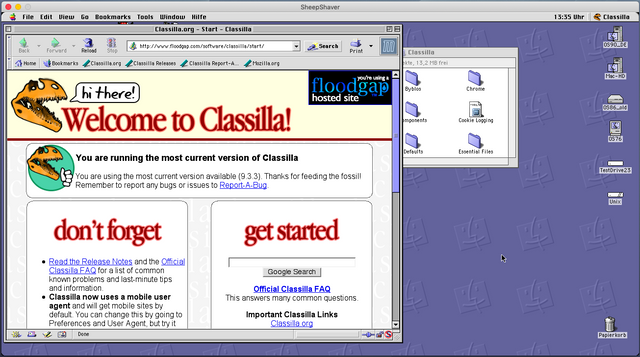 For a PPC browser, Classilla is best to use, equally well for 8.6 or 9.0.4. I never saw much sense in using a web browser within an emulated MacOS and many old browsers are disfunctional for one reason or the other today. If you need a web browser badly, both iCab and Classilla should work, given that slirp is set in the emulators GUI and TCP/IP is set to DHCP via ethernet on the Mac side. I´m using MacOS localisations criss-cross: German, English, Danish and Spanish (sometimes) and your error is not related to the language localisation for sure. In any case, please do set up a new MacOS on a fresh volume from a CD image. If you should run into trouble extracting a IMG file, I might set up a bootable volume for you. PS: Pictures may be added by using an external host like ImgBB with a BBCode added in your posting. and i have 1,014,686 K.
But i can open iCab. How much memory have you allocated to the virtual machine? Possibly too much, and the addressing is getting confused. Hey guys, im new here. English is not my first language so bare with me. I used to have a IMac G3 Indigo, from 2000 i hink? It had a slot-loading disk tray. I had a few games on it, remembering it that just brings me back huges amounts of nostalgia, all my family used to gather around the computer and play, it was a wholesome time. Either way, the pc broke down in 2007 and it was too expensive to repair it. Then I came across SheepShaver a couple of days ago and got it all set up, installed some of my chillhood games and spend some days playing. It all works well, im not a big pc nerd but i can manage myself. My problem is, no longer what i try i cannot make the OS virtual Harddrive bigger than 1GB. Even if i create a 5gb disk, when i boot the OS it only recognizes 1gb of storage. I looked online to see if Mac OS 9.0.4 could only support 1gb, but no, the OS can support up to 190gb. And i remember that my old Mac had a 4GB harddrive so it should support more than 1gb. I seem to recall a similar error when creating disk images. As making disk images can easily be resolved in OSX, I never bothered. The 6th DL was made available by Cat_7 for PearPC some time ago, it will work with other emulators too. All .bz2 files should be expandable with 7Zip in Windows. Depending on your cpu, inflating may take some time. I recall my Pentium III was busy that long that I thought my OS had crashed. Sorry for the long delay iKnow. I´m running Classilla with 82070k, thats the recommended value methinks. How much RAM do you have assigned to SheepShaver? Turn off virtual memory in the MacOS settings, if enabled. SheepShaver does not support that. Also make sure that you copied the Classilla folder to your SheeShaver HDD, not to the SheepShaver desktop. MacOS versions prior to MacOS 8.6 will not work with Classilla. I have installed SheepShaver on Wondows 10 Pro 64bits and I have a problem when I try to install a program; the error message is the following: "Sorry, but a disk related error (-43) has occured." What is the problem ? Difficult to tell what goes wrong when you do not desribe exactly how you are trying to install the program.